Whether it is your colleagues, computer or coffee machine, there are plenty of things that can make you angry at work. The odd little outburst is not going to cause any harm but if you can’t keep your anger under control then you need to address the problem. Anger management is a big issue and if you don’t deal with it, it can have major implications on your career and your personal life. Prevention is always better than a cure, so try and avoid situations that you know will make you angry. If computer problems make your flare up then get someone else to deal with them. If a particular colleague irritates you then try not to work with them. It is much better to not put yourself in the situation to get angry in the first place, rather than having to diffuse it. It may take time and effort but the rewards will far outweigh the time you put in. 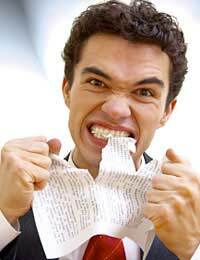 Until you admit that you have a problem with anger management then you won’t be able to get it under control. There is nothing wrong with seeking help. In fact it is the most responsible and mature thing to do. If it has been affecting your work then talk to your boss honestly about your problem and explain what you are doing to control your anger. It is also a good idea to seek outside help in the form of a counsellor or anger management group. Taking firm steps to changing your behaviour will show your boss that you are serious about changing and give you the support that you need. Sometimes is isn’t your anger that is causing the problem but somebody else in the office. In the same way that you need to if it’s your problem, your colleague needs to seek help. You shouldn’t have to be on the receiving end of their anger. If they become angry, take yourself out of the situation immediately. Do not rise to them as getting angry as well will only make the situation worse. If you have notices the problem, then so will your colleagues so approach your boss together and explain what the problem is so they can initiate some help. Getting angry all the time doesn’t help anyone and only makes every situation ten times worse. Admitting you have a problem is the first and most important step. Then seek help both at work and personally so that you can take practical steps towards getting your anger under control.